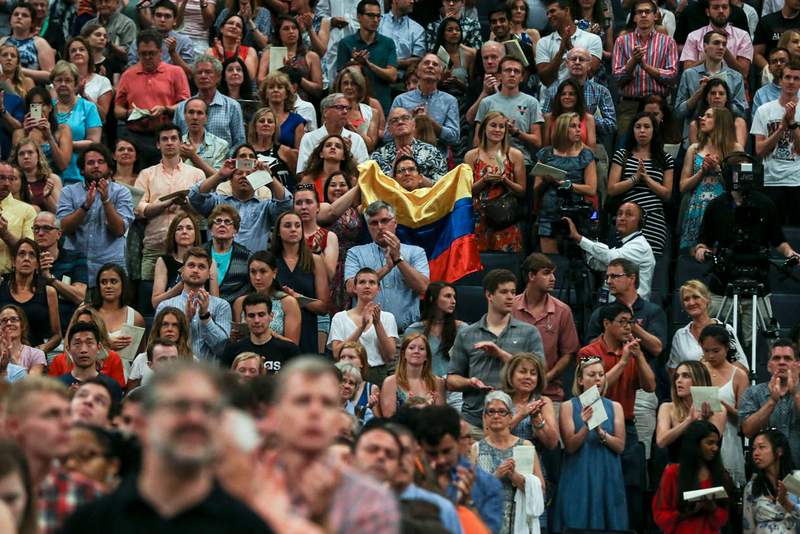 In his Valedictory address at the John Paul Jones Arena, Colombian President Juan Manuel Santos told University of Virginia graduates that they would face more failure than success in their lives, but that learning from those failures would help them attain success. “If you learn how to use the incredibly valuable lessons that failure offers you to further your goals and dreams, then, and only then, your life will end up being a true success,” he said. Santos, father of Estaban Santos, who is graduating from the Frank S. Batten School of Leadership and Public Policy, was among the speakers who congratulated the Class of 2017 for completing their four years and gave them advice as they prepared for the next phase of their lives. 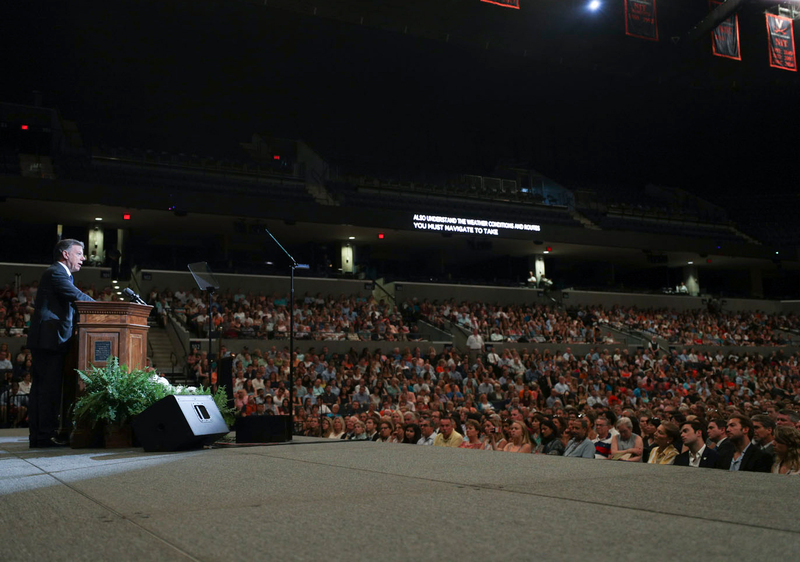 Families of the graduates filled the arena Friday afternoon for the Valedictory Exercises, during which a variety of awards were announced, the class gift was presented to University President Teresa A. Sullivan and class leaders reflected on the class’ four years at UVA. Before the ceremonies, the families were serenaded by student a cappella groups. A former journalist first elected president of Colombia in 2010, Santos received the Nobel Peace Prize in 2016 for his efforts to end his country’s protracted war with the Revolutionary Armed Forces of Colombia, or FARC, a Marxist guerrilla organization. Santos cited his peace negotiations with FARC, noting that there were many failures along the road of the talks. He said that previous administrations in Colombia had tried to defeat the FARC and failed, leaving both sides unwilling to make and maintain peace. Santos said he started reaching out to FARC as a journalist and was called a traitor. As minister of defense he waged war against FARC. When he was elected president and announced that he would pursue peace with the rebels, he was again branded as a traitor. He said once the peace process was completed, Colombian voters rejected the measure. Shortly after that he received the Nobel Peace Prize and reopened the negotiations, eventually producing a better agreement. Santos urged the graduates to plot their own courses and not be deterred. Santos closed his remarks with an appeal to unity. “Your generation has compassion,” he said. “Your generation believes in the unifying power of love. Your generation sees diversity as a strength, not a weakness. You will do the right thing for the rest of us, because you understand that this is not the moment to come apart, but to come together. This is not the moment to turn away, but to reach out. This is not the time to disconnect, but to re-connect. Santos received a standing ovation for his remarks. Class Trustee Joshua M. Cockream opened the ceremonies and in his welcoming address recounted some of the high and low points of the past four years and what they meant to the graduates. And he reminded his classmates that while they were going their separate ways, they would always have a bond. Samantha C. Westrum and W. Wyatt Moorer, co-chairs of the class giving committee, presented Sullivan a check for $316,517 from the donations of the graduates. In thanking the graduates for their donations, Sullivan said more than 400 programs have benefitted from the class’ generosity, with the money broadly distributed. 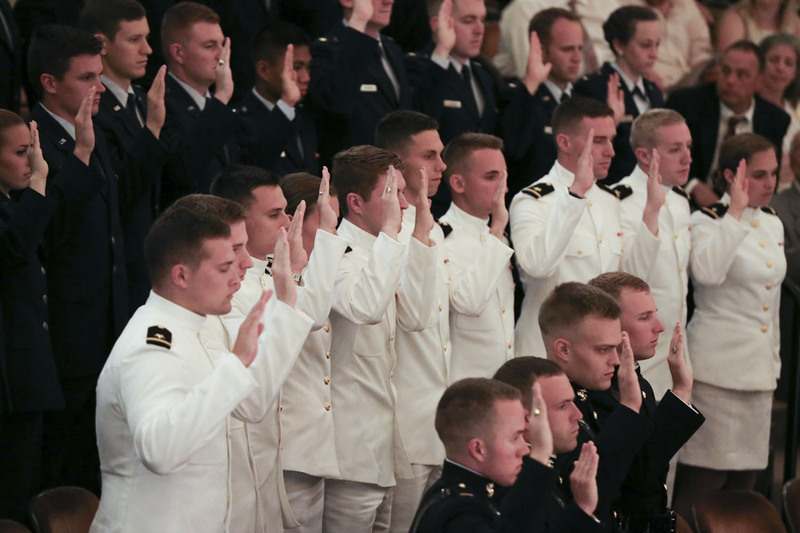 Sullivan also cited for praise the members of the graduating class who were commissioned into the Army, Air Force, Navy and Marines through the school’s ROTC program. Sullivan told the students how much she has enjoyed getting to know them over the past four years and watching them overcome adversities that other classes have not had to face. Class Vice President Joshua W. Leidy reminded the graduates of all the support they had received along the way from family, friends, faculty and University staff. He also noted that roommates and classmates and friends had turned into a family. Class President Patrick F. Rice closed out the ceremonies, reminding the graduates of how they were when they started at UVA four years ago. He cited the importance of handshakes — as greetings, as farewells and as a way of closing a deal. He said the uncertain youths of four years ago who were shaking hands in greeting, would now be shaking hands, with their professors and each other, in farewell, but doing so after they had formed a bond with one another. He urged the graduates to shake hands with one another, as a way of honoring the education they have received. The graduates, and their family members, stood and shook hands with one another.